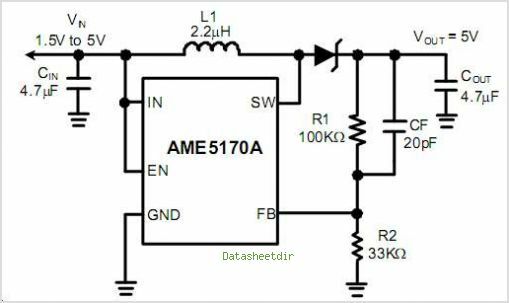 The AME5170A is a fixed off-time Step-up DC/DC con- verter in a small SOT-25 package. The AME5170A is ideal for LCD panels requiring low current and high effi- ciency as well as LED application for cellular phone back- lighting, PDAs, and other hand-held devices. The low 400ns off time allows the use of tiny external compo- nents. AME5170A is designed to drive up to four white LEDs in series with a constant current from a single Li- lon battery. To control LED brightness, the LED current CAN be adjusted by applying a PWM (pulse width modu- lated) signal with a frequency range of 100Hz to 50KHz to the EN pin. By AME, Inc. This is one package pinout of AME5170A,If you need more pinouts please download AME5170A's pdf datasheet. This is one application circuit of AME5170A,If you need more circuits,please download AME5170A's pdf datasheet.